However, geographers say that this area in the South of Europe and the Balkans, not large but unique for its diversity, was created in ancient times by the strong forces of nature. Made by forces or not – it turned beautiful and unusual – magnificent. Wild beauty, as everyone said! 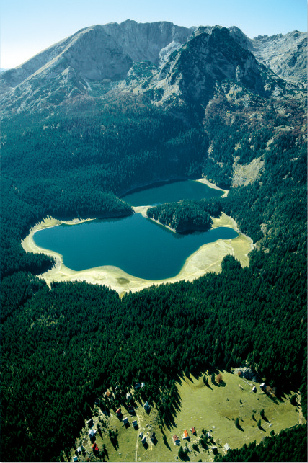 Durmitor is one of the most beautiful and famous National Parks. With the decision of UNESCO’s International Committee for the World Natural and Historical Heritage from 1980, NP Durmitor was included in the list of the World Natural Heritage. Center of the park is Žabljak, small town at the bottom of the southeastern part of Durmitor. This settlement, which is located at the highest altitude of the Balkan Peninsula (around 1.450m) is the biggest mountain holiday center in Montenegro, with considerable accommodation capacities, both hotel and private, infrastructure for sports and services in the area of tourism and mountaineering. Mountaineering paths are marked and there is an organized mountain climbing guide service. With our expert partners in different field of active holiday, we can offer special adventure packages for your stay before, during and after event Durmitor Orienteering Challenge 2017. At just an 143km distance from Zabljak, there is a famous Boka Kotorska bay at the Adriatic sea coast, so its wonderfull opportunity to mix your active holiday with mountain and sea coast. With our partners we can offer you different type of accommodation at the sea cost as well. The 293 km long coast cherishes the spirit of Mediterranean with its stone walkways, six cities of ancient civilizations, botanical gardens with plants brought by the sailors from different parts of the world, carnival parades and fiestas throughout the whole year. Beaches are famous for their beauty, for being different, and for their curative effects. In summer time the cast is the centre of entertainment and cultural events, musical and film events and international competitions.